Services | Spatial Innovision Ltd.
Spatial helps clients in a wide range of industries solve business problems by implementing GIS and GPS Solutions. These industries include Urban Planning & Development, Telecommunications, Utilities, Insurance and Land Management to cite a few. Spatial has over 20 years of experience in implementing GIS solutions across the Caribbean. This experience includes project planning and enterprise integration. Our broad network of partners helps you create the GIS solution that specifically meets the needs of your organization. Our staff represents expertise in highly complex design, development deployment, and integration of GIS and GPS solutions. 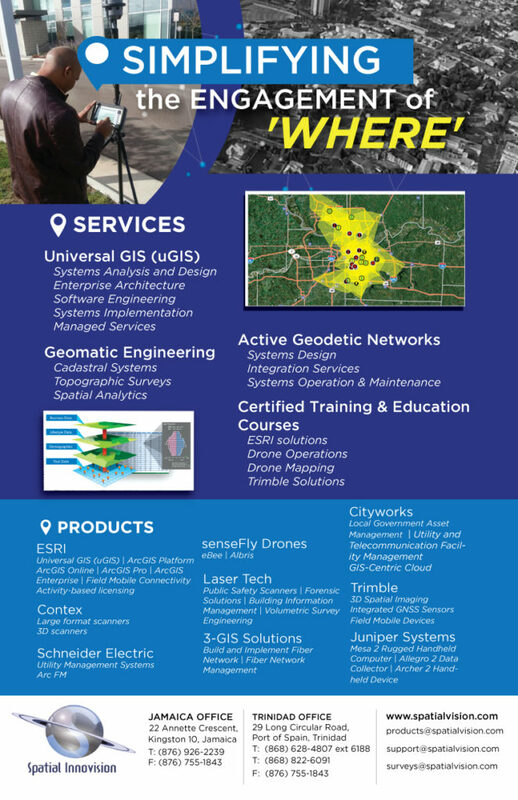 Spatial can help you with knowledge transfer assistance, while deploying GIS on your own, customization of off-the-shelf GIS technology, or the delivery of a ready-to-use enterprise system, we offer services to support you. We offer Certified training in ESRI and Trimble products. Copyright (c) 2012 Spatial Innovision Ltd.